How Dangerous is an Untreated Dental Infection? A dental infection can be anybody’s nightmare. Many people think that oral health problems won’t pose serious effects on one’s health but wait until your dentist tells the scary truth about them. Oral health problems such as dental infections shouldn’t be taken lightly. You may have heard about tooth decay and gum disease, but you might have no idea how serious they can become when disregarded. Dental infections can become life-threatening when they develop from an untreated dental abscess. An abscess is an accumulation of pus, which composed of white blood cells, dead tissue and germs. When the infection spreads, complications arise. Fortunately, with the help of certain dental procedures, your dentist can help prevent the detrimental health effects of dental infection. What could be the possible effect of an untreated dental abscess? An infection in your body is considered a threat. If they are not treated, they can last for several months or years. There are two types of dental abscess – one can form under the tooth (periapical) and the other in the supporting gum and bone (periodontal). An abscessed tooth comes in two different forms: acute and chronic. When there is sharp and abrupt pain, then that is identified as an acute abscess, which comes on quickly. However, if the person experiences low-grade pain lingering for months, that it is called chronic abscesses. Chronic abscesses are more dangerous than the acute type because it can cause damage to the tooth, jawbone and soft tissue. With a chronic abscessed tooth, the patient may put off the treatment because the pain is bearable. However, by the time, the patient visits the dentist, the infection may have advanced beyond teeth, and your dentist may need to extract the affected tooth in order to remove the infection. An infected gum (periodontal abscess) develops due to the infection in the space found between a tooth and gum. The infection may occur when the foods gets stuck between this space. If you have gum disease, bacteria can accumulate below the gum and in the bone. Several studies indicate the connection of gum disease to several diseases such as diabetes, rheumatoid, cardiovascular disease and certain forms of cancer. Know that gum disease is an infection of the tissues supporting the teeth and is mainly caused by bacteria build-up. An abscess will not disappear on its own. That’s why it’s crucial to visit your dentist right away once you notice the symptoms. Symptoms of dental abscess include throbbing toothache, sensitive teeth, foul taste in your mouth, difficulty opening your mouth and fever. Drain the abscess through root canal treatment, followed by a filling or dental crown. If the affected tooth is severely damaged, tooth extraction is required. In rare occasions, the infection that results in abscess may spread and cause serious oral and medical problems. Some of the possible complications of untreated dental infection are osteomyelitis (infection of the nearby bone), sinusitis, dental cyst, infection and clotting of the vessel and sepsis (a potentially life-threatening complication of an infection). Keep in mind that abscesses are always serious as the infection can be spread through your blood and contaminate your body, which results to serious health conditions. For this reason, you need to consult your dentist as soon as you experience the symptoms. Our comprehensive dental check-up and preventative dentistry help you know the present state of your dental health while improving your overall oral health wellness. This means that you are more capable of keeping your mouth exceptionally healthy and avoid serious dental problems like dental infections. We also deliver high-quality procedures to get rid of the infection safely and effectively. For more information about treatment and prevention of dental abscess, visit your Toorak dentist at Simply Smiles Dental. Don’t miss our latest dental offers. Contact us on (03) 9826 2220 or request appointment online. 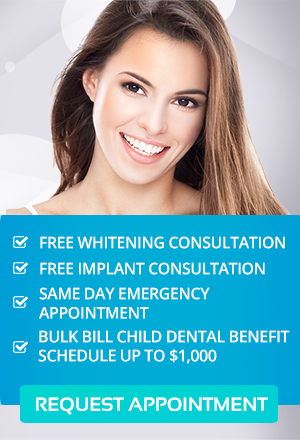 We offer FREE Teeth Whitening and Dental Implant Consultation. Bulk Bill Child Benefit Schedule Up to $1,000.